Released in the U.S. originally as the heavily edited Creepers, the 1985 film Phenomena is arguably the purest mix of Argento’s two trademark styles: the giallo and supernatural horror. It is tantamount to Carrie White as a detective in a slasher film. As a serial killer is murdering young women, responsibility falls to an outcast schoolgirl with specific telepathic powers and an aging entomologist to solve the mystery. They are assisted by the telepathic abilities of insects (a theme that also featured briefly in Argento’s giallo opus Deep Red). It all may sound a little out there, but it actually comes together for an interesting and scary film containing all the strongest elements for which the director is known. The film opens with a teenager (played by Argento’s daughter, Fiore Argento) being stranded in the Swiss countryside after her bus takes off. The young woman approaches a seemingly quaint house where she is attacked by an unknown assailant. After a brief chase, she is trapped in an observation tower overlooking a waterfall. As the girl is stabbed, her head crashes into a window in magnificent slow motion. What makes this moment work so well is how dramatically it is set up and then followed by a brutal beheading. The decapitation is quick as her head falls almost unremarkably into the waterfall. The audience is shocked by the juxtaposition of such opposing images. An intense buildup to the moment followed quickly by a mundane view of such a gruesome act. 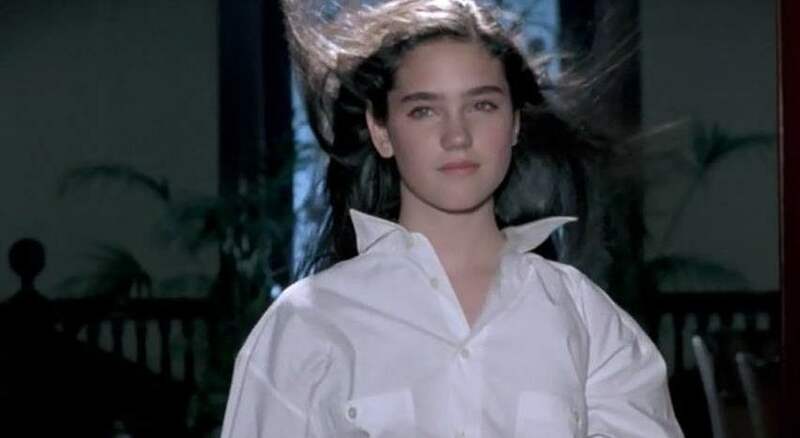 After an effective opening, Phenomena moves forward to introduce the audience to McGregor (Donald Pleasence) and Jennifer (Jennifer Connelly). McGregor is an expert on the study of flies and recently lost his assistant to the murders occurring in the area. 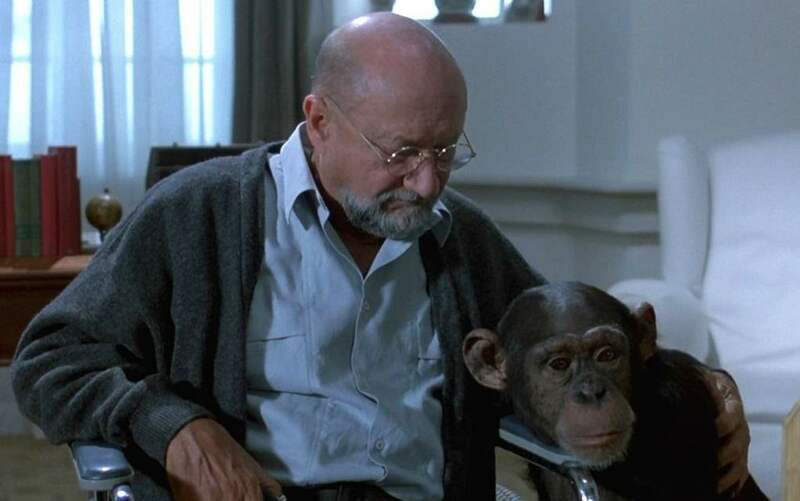 He is now assisted by a chimpanzee (this was the 1980s) who becomes a significant character as the film progresses. Jennifer, a new student at a Swiss boarding school, has a sleepwalking problem and a special talent that allows her to communicate telepathically with bugs. After one sleepwalking incident sees her bearing witness to another murder, she ends up being guided to McGregor’s home by none other than his chimpanzee assistant. Most of the staff and her schoolmates are rather hostile to Jennifer, so a friendship with the elderly entomologist is quite welcome. Especially as she is able to confide in someone about her special gift. Eventually the two characters come to use their insect friends to help identify and stop the killer. They are motivated by different reasons, yet their common goal leads them down a dangerous path. Connelly’s character shows a striking defiance towards menacing authority figures, illustrating an independence necessary to stand up to the maniac wanting to cause her harm. Pleasence stands in as a pseudo father figure with the knowledge to guide Jennifer on her path. Their characterizations are more than believable, which is necessary to carry a film featuring other less convincing performances. Another actor worth mentioning in the film is Daria Nicolodi. Playing a chaperone in this feature, Nicolodi is a staple of Argento’s work and was romantically involved with the director for some time. Nicolodi co-wrote Suspiria, and appeared onscreen in many of his films, including Deep Red and Tenebrae. Nicolodi’s performance in Phenomena is strong and highly effective. True to Argento’s style, the music of Phenomena plays an important role in setting up the atmosphere. The main theme is haunting and with an other-worldly lead voice that suggests a supernatural influence. What is most striking in this 1980s horror movie is the use of heavy metal music. It appears most noticeably in two scenes, both involving Jennifer realizing the true danger that surrounds her. Contemporary audiences may find the heavy metal soundtrack out of place but considering the time frame in which Phenomena was produced it is quite effective. Instead of a chilling, repetitive theme playing as the final girl runs, this use of aggressive music is startling and brash. Heavy metal was considered by conservative parties in the 1980s to come from an evil source. Thus, when Jennifer is running from the killer there is no doubt that evil is chasing her. As a deliberate device, Argento seeks to make his film unique among the many slasher films of that time period. Phenomena is a highly recommended piece from the cannon of 1980s horror. A film combining mystery as well as supernatural elements, it fits nicely among the works of Dario Argento. One would do well to remember that Argento is an artist who chooses to play on the senses of the audience. He provides surreal settings as the backdrop in which any gore is intended to create a visual impact instead of achieving realism. This feature contains a most gruesome sequence that sees the heroine literally falling into a pit of decomposing corpses. The film’s visuals are combined with specific musical choices that ultimately allow the audience to experience something dreamlike (or nightmarish) come to life. Horror fans that have not yet had the pleasure of seeing this picture will find much to enjoy, as it is filled with powerful images and strong lead performances. Original Suspiria Star Boards Remake!